Ketterlinus Gymnasium is located in downtown St. Augustine. Our facility offers a variety of amenities to the public. We have a gymnasium, two outdoor basketball courts, two indoor volleyball courts, computer lab, and Teen Center. Located behind Ketterlinus Gymnasium are the City of St. Augustine Tennis Courts, Events Field, and Project Swing. For information regarding these amenities please contact the City of St. Augustine at (904) 825-1004. Youth Basketball – Do you have a son or daughter between the ages of 7 and 14 who just can't stop bouncing that basketball? Would you like a place for them to develop their basketball skills? Then join the St. Johns County Parks and Recreation Department Youth Basketball League. Registration begins in October. 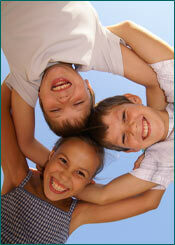 After School Program – For children in Kindergarten through fifth grade. Supervised by motivated staff, we provide time for children to complete homework and enjoy recreational activities during the afternoon. The St. Johns County Recreation Department does not provide transportation to any of our after school centers. Pre-registration is required for these programs due to the limited space. For more Youth Activities information, please call Stephanie N. Taylor at (904) 209-0381 or sntaylor@sjcfl.us. Men’s & Women’s Volleyball – Season is from October - December and is played at the Ketterlinus Gym. Co-ed Volleyball – Coed is played from January - April at Ketterlinus Gym with an "A" & "B" division. For more Adult Activities information, please call Willie Cooper at (904) 209-0395 or wcooper@sjcfl.us. We have a variety of events throughout the year. Please contact us for the latest list of programs and events.